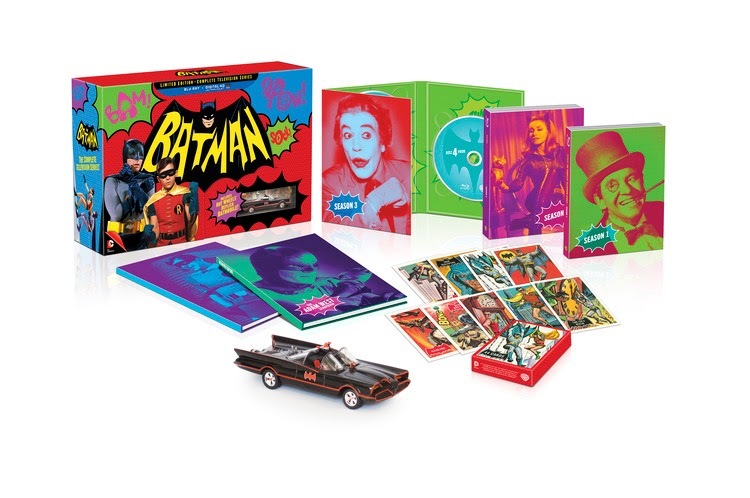 Batman: The Complete TV Series Collector’s Edition is available for the first time on blu-ray from November 10th. For the very first time the fan-favorite original 1960’s Batman TV series, starring Adam West as Batman and Burt Ward as Robin, will be available on Blu-Ray™, DVD and Digital HD. Batman: The Complete Television Series features all three classic seasons of the fan-favorite show, including all 120 original broadcast episodes completely remastered, as well as over three hours of never-before-seen enhanced content including interviews with both Adam West (as Batman) and Burt Ward (as Robin). In addition to favourites West and Ward, the series featured a long list of notable guest stars and cameo appearances over the course of three seasons including Julie Newmar, Cesar Romero, Liberace, Vincent Price, Burgess Meredith, Bruce Lee, Sammy Davis Jr. and many more! will be individually numbered, making the set a true must-have for both fans and collectors alike. Hanging with Batman – A true slice of life in the words of Adam West. Holy Memorabilia Batman! – A journey into the most sought-after collectibles through the eyes of three extraordinary collectors. Batmania Born! - Building the World of Batman – Explore the art and design behind the fiction. Bats of the Round Table – A candid conversation with Adam West and his celebrity friends, chatting all things Bat ’66. Inventing Batman in the words of Adam West (episode 1 &2) - A rare treat for the fans as Adam discusses his script notes on bringing Batman to life in the first and second episodes. Na Na Na Batman! — Hollywood favorite’s stars and producers recount their favorite Batman memories.